Jeb Bush is getting specific about how he plans to grow the economy as president. In a Wednesday op-ed in the Wall Street Journal, Bush outlined his plan. It contains a lot of Republican tax-reform standbys — fewer brackets, fewer loopholes, lower corporate rates — along with a couple of surprises, like closing a loophole that allows some Wall Street fund managers to pay lower taxes. And all of it comes packaged in Bush's campaign-trail promise that he can grow the economy by 4 percent. Here's a look at the plan, as well as a dive into what it will cost and how it could affect the economy. Before we dive into the plan's effects, here's a quick rundown of the big things Bush's tax plan would do. Several of the provisions are clearly intended to entice lower- and middle-income Americans, who have taken center stage in an election focused on the plight of the middle class. 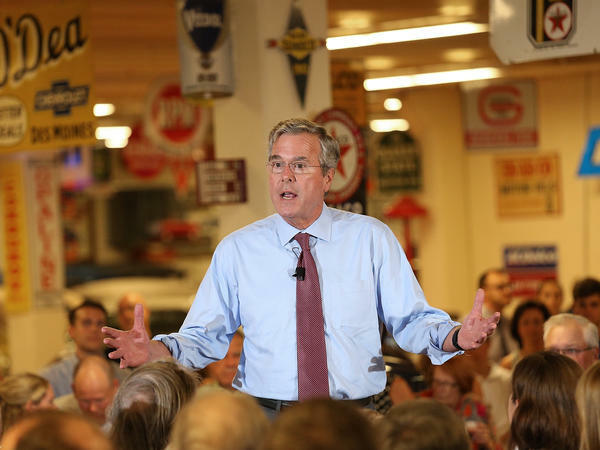 The Bush campaign estimates that 15 million more families would pay zero income taxes. On top of the current roughly 66 million, that would bring the share of filers paying zero taxes from around 40 to nearly 50 percent, based on figures from the Tax Policy Center. The plan would either lower or hold the marginal rates at every income level compared with where they are now, and substantially lower the top rate from 39.6 to 28 percent. But then, the plan would also eliminate some deductions and cap the amount that people can deduct, which would offset some of those lower rates. For example, Bush would eliminate the state and local income tax deduction, which overwhelmingly benefits higher earners, and cap the amount of deductions a filer can take, which also would affect higher earners more. So the question of whether a high-income household would see a higher or lower tax burden in part depends on the amount of deductions they take. Interestingly, that could mean more pain for blue states. The highest-tax states in the nation include Democrat strongholds like New York, New Jersey and California. Meanwhile, several red states, like Wyoming, Texas, and South Dakota, have no state income tax. Eliminating the deduction would mean a higher bill for some big earners in those higher-tax states. There's also plenty for businesses to like. The plan would cut the corporate rate from 35 to 20 percent and change the U.S. system from a worldwide to a territorial system — that is, it would start taxing businesses only on earnings they make in the U.S. Business groups like the Chamber of Commerce have long pushed for this kind of system, claiming it would make the U.S. more competitive. But how expensive is it? This is one of the most important questions about the plan. One early estimate indicates that the plan won't pay for itself. In a paper from the New York-based Center for Global Enterprise (flagged on Wednesday afternoon by the Post's Jim Tankersley), economists including Bush advisor Glenn Hubbard say the plan will cost $1.2 trillion over the next decade, even taking economic growth into account. That's a 3-percent reduction from current projections. Without growth, the plan would cost an estimated $3.4 trillion. Therefore, the plan will have to come alongside "strong fiscal discipline," the authors write. However, this is just one estimate, and other organizations may have their own in the coming weeks. It's true that the plan has a few routes for raising revenue: eliminating the carried interest loophole and limiting deductions, for example. That said, the plan also cuts tax revenue in several ways — cutting the top marginal rate from 35 to 28 percent, for example, and cutting rates for a lot of people below that as well. Not only that, but it would lower the corporate tax rate to 25 percent. And, perhaps most notably, it could create millions more earners who pay zero in income taxes. Bush writes that "roughly 15 million Americans will no longer bear any income-tax liability," though it's not entirely clear that that's 15 million in addition to the roughly 66 million who have zero or negative income taxes right now. To the degree that the plan can inspire growth, it would considerably diminish the reduction in revenue it would create. But spending cuts may also be in order if Bush wanted to make sure he isn't growing the deficit. But can his plan grow the economy? This is the big question, given the potential effects on revenue. A few provisions in the plan do look good for economic growth. Bush plans to expand the earned income tax credit, for example, and there's good evidence that the EITC incentivizes work, boosting labor force participation. In addition, Bush would allow businesses to "fully and immediately deduct new capital investments," an idea that Republican tax plans have pushed for years. "Immediate expensing is a big deal," says Michael Strain, resident scholar at the American Enterprise Institute. And the effects of it could go well beyond simple business investment. "The idea is that incentivizing investment will lead to more investment, which will make workers more productive, which in turn will increase their wages." In other words, your bosses invest in better machinery, and you can get more done, meaning you're more valuable and worth a raise. Wages have been troublingly stagnant for years now. But even if you believe a president can create sustained 4 percent growth (which is already a huge assumption), it's not at all clear that overhauling the income tax code itself can grow the economy much. "The record on tax cuts and growth is just weak," says William Gale, an expert on tax policy at the Brookings Institution. He says economic growth has remained remarkably stable over the years, when you consider the massive changes in the tax code that have also happened. Some tax increases have been associated with faster growth, and some tax cuts have likewise come alongside slower growth. "It's not that taxes have no effect, it's that other things affect the economy," he says. "We tend to focus on taxes because it's something we can control. But the evidence that we can flip the switch on tax policy and it creates growth is not there." A 2012 Congressional Research Service paper, for example, found that the top tax rate doesn't seem to have much of an effect on economic growth. Likewise, in a fall 2014 paper, Gale and former George W. Bush economic adviser Andrew Samwick found that tax cuts themselves don't seem to create higher growth. Rather, they concluded, growth comes from carefully calibrated fiscal policy — in particular, tax cuts can't be paid for with more government borrowing (which can lower long-term growth). Instead, they need to come alongside spending cuts — and even then, only "unproductive" spending should be cut. Cutting productive programs, like those that help people get educated or get basic needs like food, says Gale, could do more harm than good. How does it compare to other tax plans? Bush's tax plan is a very Republican tax plan, with a lot of the standard Republican ideas. Indeed, it looks a lot like Mitt Romney's 2012 tax plan, as Tankersley points out. It has some similarities to his GOP opponents' plans as well — it reduces the number of brackets, for example. Chris Christie, like Bush, would create three brackets, and Marco Rubio would create two. It expands deductions and credits to help lower- and middle-income earners, like Rubio's plan. It lowers the corporate rate and shifts the corporate system to a territorial system — a longtime GOP talking point. But it also contains one notable populist touch: an end to the carried-interest loophole, which allows some fund managers to pay lower taxes on their income by claiming it as capital gains. Donald Trump has likewise talked about doing this to raise taxes on "hedge fund guys," and both Hillary Clinton and President Obama have pushed for it in the past. Perhaps most surprising in the plan is the idea of growing the number of people who owe zero in taxes. If indeed Bush's plan adds 15 million tax filers to that group, it would clearly distance him from one of Romney's biggest mistakes in the 2012 campaign. A video of Romney decrying the "47 percent" of Americans who pay zero income taxes proved damaging to his run, making him look callous by implying that nearly half of the U.S. doesn't contribute to society. 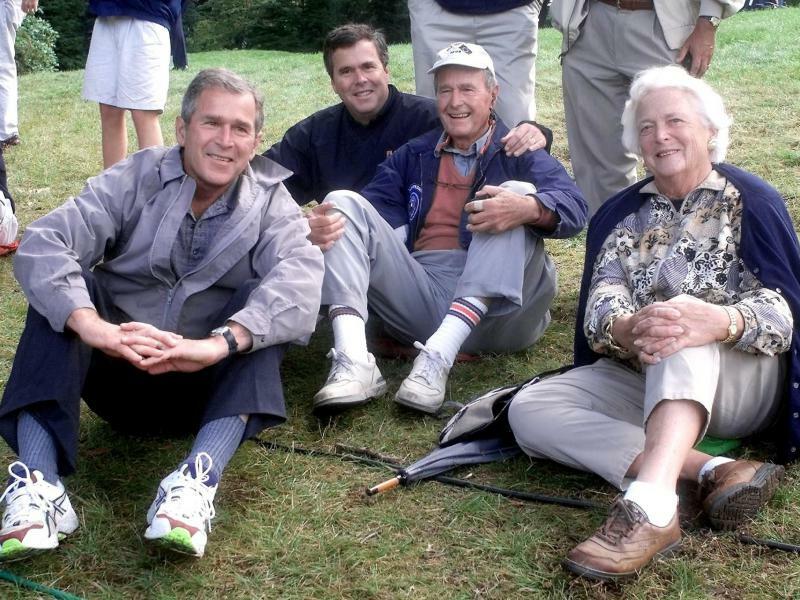 Bush clearly wants to avoid being painted with the same brush. 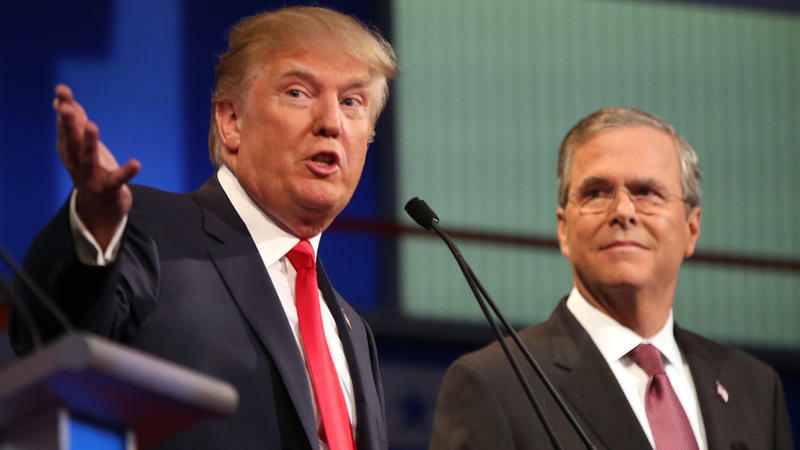 Jeb Bush isn't pulling punches anymore when it comes to Donald Trump. The former Florida governor has delicately danced around the billionaire businessman in the 2016 presidential primary so far. But the gloves came off this week when Bush called out Trump as a closet Democrat. He was trying to stunt Trump's rise while attempting to recover his own political mojo.